The public affairs officer for the San Francisco field office of U.S. Immigration and Customs Enforcement quit last week to protest Trump administration statements that 800 people evaded arrest because Oakland Mayor Libby Schaaf issued a public warning that an immigration sweep was imminent. ICE arrested 232 people during the four-day sweep in late February, but federal officials have repeatedly stated that many others would likely have been caught if Schaaf had not warned the public a day before the operation began. The next day on Fox News, Homan said, “There’s 800 that we are unable to locate because of that warning, so that community is a lot less safe than it would have been." In an interview with the San Francisco Chronicle on Monday, public information officer James Schwab said he objected to that characterization. Schwab said statements about immigrants evading arrest were misleading “because we were not ever going to be able to capture 100 percent of the target list” of roughly 1,000 undocumented immigrants in Northern California. In recent months immigration operations have led to dozens of arrests, rather than many hundreds, according to ICE press releases. 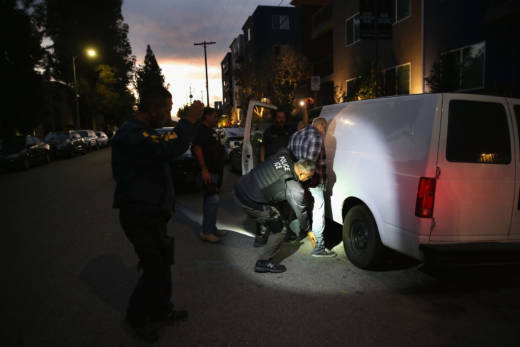 Typically ICE agents arrest 30 percent of their targets during large-scale enforcement operations, a Department of Homeland Security official told the New York Times after the Northern California arrests. An agency spokeswoman said the 864 people described as evading arrest in Northern and Central California were wanted for "violating immigration law," in response to a KQED request for information about why they were considered public safety threats. She provided just five examples of people on that list who ICE believes have been convicted of serious crimes. ICE officials have declined to clarify the criminal histories of the people arrested in the Northern California region last month, relying instead on categories that lumped immigrants convicted of murder with those found guilty of entering the country illegally (a federal misdemeanor). Of the 232 people arrested, ICE stated that 115, or just under half, had “prior felony convictions for serious and violent offenses” or past convictions for "significant or multiple misdemeanors." The other half had no criminal history. Bennett did provide a list of “the most egregious criminal convictions of those arrested,” which ranged from marijuana possession and disorderly conduct to aggravated assault and drug trafficking. Of all those arrested, 52 neither had criminal histories nor had been ordered deported, according to ICE. Schwab had said a more detailed breakdown on the arrests was in the works before his resignation Thursday. The San Francisco field office is responsible for an area that extends from Bakersfield north to the Oregon border and includes 49 counties.